Da Nang is ranked as Vietnam's third largest city, the travelers who have their final destination as Hoi An and Hue, often briefly pass through this port city. However, this city has a lot in store for everyone if you decide to discover further than the airport terminal. Da Nang has to offer a wide assortment of local, southern and northern dishes. In fact, it has the availability of the country's best food. Along with that, if you are fond of fish, Da Nang must be your first port to stop by. As the seafront is crammed with reasonable seafood restaurants. The significance of Da Nang is that it is perfectly situated between the amazing capital of Vietnam Hanoi in North and Ho Chi Minh in the south. Thus, situating at an ideal location in the country. Undoubtedly it can be considered as an ideal base for discovering the rest of central Vietnam. The elaborate and exciting ancient town of Hoi An is merely at 30-minute drive, whereas other spots such as the picturesque Marble Mountains, the capital of Hue, and the famous ancient Hindu temples at "My Sơn" are all within easy access. Eventually, Da Nang became the biggest commercial port in the area. Interestingly French also landed at Da Nang to conquer the country. Da Nang can safely be asserted as the only few places in Vietnam, with predictable weather. Temperature goes to 24 Celsius degree from May to September, which is the highest temperature throughout the year. Unlike Hue, the immediacy of Da Nang to the Pacific Ocean keeps a moderate temperate all the year. In other months, the temperature does not drop below 20. There is a periodic Rainfall in the winter months i.e. from September to January. Thereby February to May is the ideal time to visit Da Nang. It's prudent to avoid visiting this place during the summer months from June to the end of August. During these months Da Nang becomes a popular retreat for the domestic tourists. From the Marble Mountains to the Son Tra Peninsula, here is an exclusive to-do list during your stay in Da Nang, Vietnam. Da Nang has several beach areas in the surroundings. They are unpolluted, yes, they are not as spectacular as the ones in Thailand. As a matter of fact, these are the best sunbathe in the entire Southasia. They are often quite and deserted during the day until about 3 PM. Therefore, if you're looking forward to spend quality time, this is the best place to go. 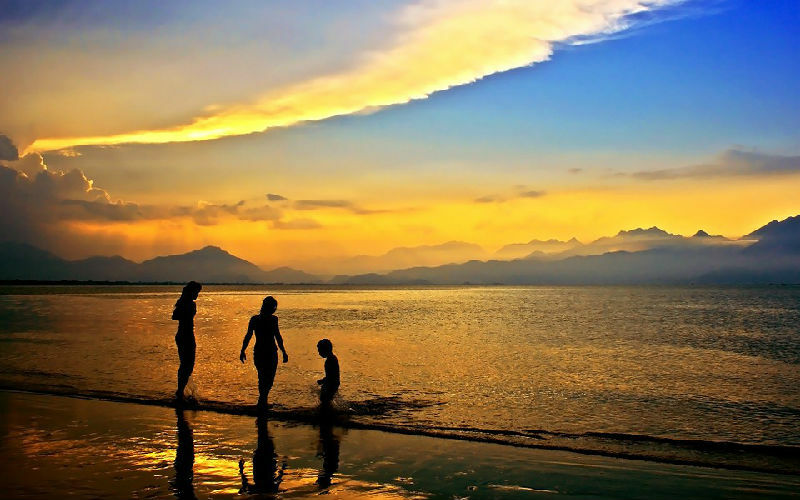 Picture: sunset on Da Nang beach. Marble Mountain or Non-Nuoc is one of the most famous attractions among the local as well as foreign tourists. It is deliberated as a "spiritual" land of Quang Nam - Da Nang. The Marble Mountain is made up of 5 spectacular mountains. These mountains are named after the 5 elements of the universe: Metal, Wood, Water, Fire, and Earth. Precisely Da Nang is a house for world-class golf courses, which is drawing golfers from all over the world. The amazing four key Golf courses are stretches from south to north of the city on the beautiful sandy beaches. Da Nang Golf Club was inaugurated in 2010. This golf club has now been ranked amongst the 15 finest new golf courses in the world by USA Golf magazine. There is an availability of first-class amenities along with great hospitality as well as amazing food which makes it the best among other Asia's golf destination. Visiting the majestic Lady Buddha must be the topmost priority in Da Nang. The 67-meter statue of Lady Buddha (Bodhisattva of Mercy) on the Son Tra Peninsula is renowned worldwide. This amazing statue is incredibly made from a single piece of marble. While walking on the main beach, the white statue is visibly noticed from a distance. The Lady Buddha safeguards the shores of Da Nang and looks after the local fishermen. Picture: Dragon Bridge at night. At the middle point of Vietnam, Da Nang is equipped with various means of transportation. Daily flights fly in and out of Danang International Airport. They connect the city with Hanoi, Ho Chi Minh City, Nha Trang and Da Lat. 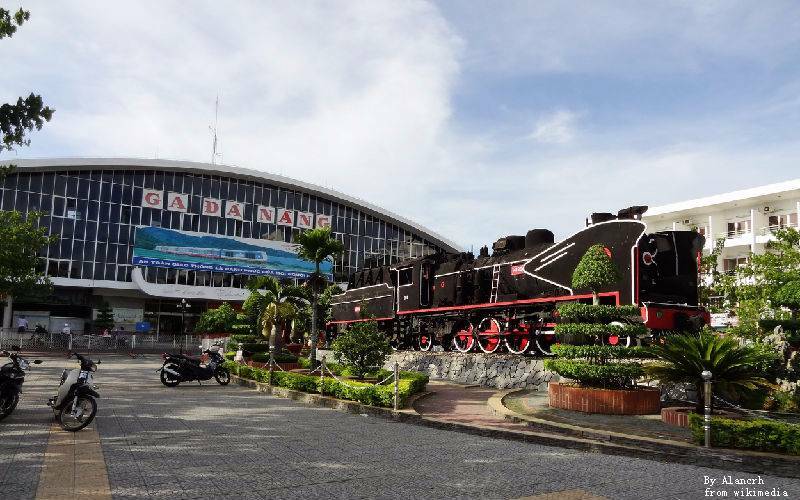 Da Nang is an imperative stopover for both North-bound and South-bound trains. The train trip is quite long-lasting to both Ho Chi Minh and Ha Noi City, however majority of the train cars are furnished with air-conditioners and soft sleepers. The ride across Hai Van Pass is tremendously picturesque so it would be thoroughly gratifying if one sits nearby the window. Unlike Hanoi or HCMC, the places of interest in Da Nang are dotted around the whole city outstretching miles in nearly all directions. For the same reason, visiting one attraction to another on foot is a tedious and tiring task, so it's best if one opts to use motorized transportation. In comparison to a taxi, grab car is an easy and economical mean to get anywhere in Da Nang. Having an App in your smartphone before commencing the traveling journey is all that you must do. For merely 5.000 VND, one can visit different places in Da Nang which is for sure an enjoyable experience. Many hotels can arrange for a rented motorbike. Or else, rented transportation is available throughout the town, look for the words “cho the xe may”. If you are searching for a convenient staying place which is close to Da Nang International Airport, People and busy nightlife, its best to stay in Da Nang city center. Meanwhile, World Heritage Sites Hoi An and My Son are reachable within a 20-minute drive from the city center. If you're looking to soak up the sun while being on a vacation, Da Nang's pristine beaches such as My Khe Beach, Lang Co Beach are an ultimate choice for surfing, snorkeling, and jet-skiing. The months of May and September are ideal for these sports. These places are usually a 10-minute drive from Da Nang City or Hoi An. Shopping at Da Nang may not be as appealing as that of its neighbor, Hoi An, but travelers can still be able to find a few shopping malls and local markets within the city center. They are worth spending an afternoon in. Han Market is one of the most popular market of this busy coastal town. This market is ran by the locals of Da Nang since 2040s during the French occupancy. If you prefer to shop for gifts in a more comfortable setting, then Lotte Mart Da Nang and Vinh Trung Plaza are the top picks. Da Nang is also simply explored on foot as most of shopping venues are set within the proximity of the city's prominent landmarks and museums. At night, the Dragon Bridge (Cầu Rồng) lightens up and exhilarating parties begin in Da Nang. There are various activities of Da Nang nightlife that both domestic and international tourists can experience. If you are in a mood to have a drink of beer or to dance, then you would be surely pleased. This city is a crucial business and a trade center, thus there will be numerous options for leisure travelers and business travelers to choose from. There are several nightclubs, bars, and lounges for all those who are looking to have an unforgettable night out. From delicate whiskeys to delicious wines to local craft beers and exotic cocktails, you will fall in love with the drinks in Da Nang's bars and pubs are considerably cheap according to the European standards. Most places are not opened till too late, yet a few will still be open till 1 am. Cost of living is much cheaper as compared to anywhere else in Vietnam. A simple noodle or rice dish which are great options for backpackers and fuss-free travelers is priced between VND 10,000 and 30,000 VND. However, the barbecued delicacies cost around VND 30,000 and more. •A 5-star hotel room or 5-star resort costs $170 and more. This city also has several international standard resorts, they are costly but provide impeccable services and accommodation facilities. Most hotels will raise their charges up to 30% in the peak season. If you are planning to visit in summers, light and natural fabrics such as cotton or silk are ideal for hot & humid weather. The attires such as Tank-tops, short sleeve shirts, or T-shirts are most appropriate. Light khakis will also be good enough. As for the shoes, flip flops or open sandals are going to be the best of choices because when it's hot, your feet will be comfortable in them and when if it rains, there would be no hassle of wet shoes throughout the journey.